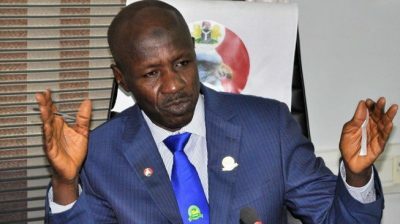 Ibrahim Magu, acting-chairman of the Economic and Financial Crimes Commission (EFCC), has asked Nigerians to be vigilant in 2019. Speaking in Gombe state on Monday, the anti-graft czar said vigilance is important whether Nigerians vote for the current administration or change leadership. He also appealed to every Nigerian to take ownership of the fight against corruption. “As we move closer to the general elections where Nigerians will vote for the present government or a new leadership to take control of governance, it is time that we all must be vigilant,” he said. “We all must be careful as citizens to ensure that only people with proven records of integrity are elected into offices. He, however, added that the anti-graft agency has recorded 172 convictions from January to date. “As I speak, EFCC has recorded over 172 convictions since the beginning of the year and we expect the figure to improve significantly before the end of 2018,” Magu said. The chairman urged Civil Society Organisations (CSOs) religious organisations, traditional leaders to help in sensitising voters to vote right and not to compromise.